Why can't I activate MATLAB or start the network license manager in a newer Linux environment? When trying to activate MATLAB on newer Linux versions, the activation fails. Checking the Host ID shows that the Host ID is 000000000000 which does not work. I also experience issues with the network license manager where it will not start on these new distributions. How can I activate MATLAB or use the license manager in this environment? How can I activate MATLAB on a Linux machine that does not have an eth0 device? For MATLAB R2013b and earlier, licenses can be activated on a machine with no eth0 using a udev rule to rename the device to eth0. There are other methods of changing the name of the ethernet device, but many of them are distribution specific and can not be guaranteed work on all distributions. udev rules take priority on all systems running the udev framework. For releases R2008b and earlier MATLAB must be locked to an eth0 device. Is there a way to do the activation that does not involve changing the system configuration. Renaming the network interface may require reconfiguring other parts of the system, which is not ideal. My understanding is that it depends upon the MATLAB release, that in sufficiently new releases, it scans the ethernet table at the time of activation and registers all of the interfaces that exist at that time, by MAC address. I could be wrong on this as I have not installed MATLAB on a Linux system for a while. I ran into the same issue while attempting to reinstall Matlab 2010b on a Fedora 20 (3.19.5-100.fc20.x86_64) system. The reinstall failed after Fedora was upgraded. "Error 1,714. Unable to activate your machine. This activation process cannot detect a valid Hist ID which utilizes a currently supported naming convention. Please refer to the following solution ID to help resolve the issue 1-661QJD"
Apparently, Matlab is looking for an eth0 device and fails to find it. This was confirmed by Matlab Technical support Case Number is 01379776 and I was directed to this site. The accepted answer at this site did not work on Fedora 20, and hence this comment. It did help me find a solution. My configuration uses and ASROCK X-58 Supercomputer Motherboard with 2 on-board ethernet devices. Fedora 20 systemd supports BIOS provided numbers and if that is not supported it looks for a higher level scheme provided either by PCIe index numbers, or if even that isn't available, it resorts to geographical location numbering. Typically biosdevname makes naming consistent by referring to embedded devices as em[123..], PCI cards as p<slot>p<port> etc. And on the target machine, the ports were being numbered em0, em1. The recommended steps using dev rules did not work since the 70-persistent-net.rules didn't exist and udev rules created were being ignored. The following did work. The package biosdevname was removed with "yum erase biosdevname"
"biosdevname=0" was added to kernel boot arguments in /etc/sysconfig/grub . Adding this to kernel boot args is probably an indication of paranoia, but in case biosdevname gets reinstalled, you don't want the device names to get changed. Removing biosdevname alone won't suffice since the system will now fall back to geographical numbering and start numbering devices as enp2s0 etc, if you were to reboot. To stop it from auto naming entirely, also add the following to the kernel boot argument "net.ifnames=0". GRUB_CMDLINE_LINUX="rd.lvm.lv=fedora00/root vconsole.font=latarcyrheb-sun16 rd.lvm.lv=fedora00/swap $([ -x /usr/sbin/rhcrashkernel-param ] && /usr/sbin/rhcrashkernel-param || :) rhgb quiet rd.driver.blacklist=nouveau biosdevname=0 net.ifnames=0"
There is some overlap in functionality between biosdevname and ifnames and how udev/rules are used, and it would probably go away once Fedora cleans it up. Run "grub2-mkconfig -o /boot/grub2/grub.cfg" to generate a new grub.cfg. Don't reboot yet. You have to rename your network scripts in /etc/sysconfig/network-scripts/ifcfg-em* to if cfg-eth* and edit them so NAME="em*" reads the corresponding "eth*". Now reboot and confirm your devices show eth* (use "ifconfig -a"). If you do figure out a more optimal way to do this, please let me know or post it here. Thanks for writing that up! It was kind of Walter Roberson to write that up, but I think most users don't want to alter their systems and trigger who knows what else. It was Krish Pillai that wrote all that up. -The hostid of this computer does not match the hostid in the license file. -A Designated Computer installation is in use by another user. 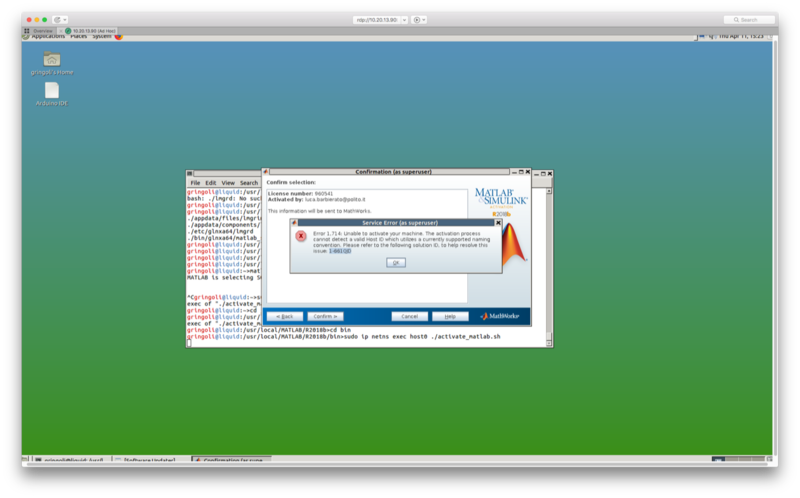 If no other user is currently running MATLAB, you may need to activate. I sincerely don't know how to solve the problem.